It's the game America has been waiting for. Jacksonville. Denver. Blaine Gabbert. Peyton Manning. 0-5. 5-0. I'm excited and I am sure you are. In the truest of David vs. Goliath matchups, it's going to take a little more than a slingshot but can the Jags stun the world and make something happen? Here are my picks for week six. What really is great about the Giants is that even though they are 0-5, they are only a couple of games out of first. However, with how pitiful and disgraceful the club has looked thus far, they aren't going anywhere fast until the secondary improves a ton, the offensive line begins to show up for games and Eli Manning stops making bad decisions (he is a lot like Favre in that aspect in that he will make a lot of bad decisions to try to compensate for bad play around him). And in that regard, I have just about no confidence in them against the Bears, who may have lost two in a row, but are still a fine club. Well at least the Josh Freeman nonsense was over and now Greg Schiano has gotten his way before he gets axed. Mike Glennon was probably not ready two weeks ago and he was all over the place against Arizona. Meanwhile, the Eagles are tied for the division lead but their two wins come against the two garbage teams in the division, Washington and New York. They will get gashed in the air by everyone, even Glennon, but considering how sloppy the Bucs are, I'll take Philly. It was a tough battle against the Titans but fortunately for Kansas City, Ryan Fitzpatrick was under center for Tennessee and he helped to give the game away with a pair of bad picks. Meanwhile in the NFL: After Dark, the Raiders rode a sterling Terrelle Pryor outing to a nice home victory over the Chargers. I think the Chiefs are bound for a loss and I like Oakland to pull off a road upset. Have to give props to Geno Smith as on Monday night he played very well and led a key drive with less than a minute left that led to the game-winning field goal to upset the Falcons. But one thing we have seen with the Jets this year is that they follow a nice win with an ugly loss and while I don't think it will be ugly, I do think they will take a step back from that emotional high and fall to a Steelers club that needs a win like no other. Even after their disappointing loss in Glendale, the Panthers' defense is rock solid and thus that makes them a tough matchup for the Vikings. Minnesota obviously relies on Adrian Peterson to key their offense, but the Panthers are tied for seventh against the run. Therefore, the Vikings could try to move the ball through the air, but the Panthers are ninth against the pass. If Cam Newton does not turn the ball over, Carolina will be in good shape. It is starting to get comical for Matt Schaub this year as he has now thrown a pick-six in four straight games. He's hindering the club and helping to waste what has been a great defense thus far but it's a good thing then that the backups are T.J. Yates and Case Keenum. The Texans should end their slide this week against the Rams who have been less than stellar, particularly on offense, as the defense will lead the way. With E.J. Manuel out after suffering an LCL sprain in the Thursday night game and our good friend Jeff Tuel came in in relief, the Bills really sputtered offensively and the Browns were able to pull out a nice win. With Manuel out for a few more weeks at least, it is going to be tough for the Bills if Tuel does not improve his play and against a stiff defense that just shut down Tom Brady and the Patriots, this could be a mess. Cincinnati is my Lock of the Week. While the Ravens find themselves in a three-way tie for first place in the AFC North, they are doing it with less than stellar play from Joe Flacco. In fact, we've seen some clowns call Flacco a "scrub," but who enjoys that kind of stupid hyperbole, eh? Meanwhile, the Packers have been alternating wins and losses this year but they got a big victory over Detroit thanks to a strong defensive effort, good play by Aaron Rodgers and the Lions being without Calvin Johnson and Nate Burleson. We should see a lot of physical play here but with the Packers looking much stronger than the Ravens offensively thus far, I give them a slight edge. So much for the Brian Hoyer Experience as he was lost for the season on Thursday after tearing his ACL, and thus we are back to Brandon Weeden under center for the Brownies. Weeden did not look great, but he did throw a touchdown pass and he helped the club hold on against Buffalo, and thus his limitations will hurt them against the Lions who did miss Calvin Johnson last week and really struggled to move the ball. Detroit is a stronger team regardless and they will pull through. We saw what I thought we would see from the Titans against the Chiefs on Sunday with Ryan Fitzpatrick under center as they were in the game but a pair of crucial interceptions by Fitzpatrick killed the club. Jake Locker will be out once again and now as the team is playing an even better defense on the road in Seattle, the club may just be in trouble come Sunday afternoon. To answer my rhetorical question from the open, absolutely not. You hate to say a team has no chance in the NFL, but this is pretty damn close. The Jaguars are going to need the good Lord on their side and even then, they may lose by 14. These two are tied for second in the NFC West right now and thus this could be a key game in deciding how good the Niners are and if the Cardinals are a real contender in the division and in the conference. Arizona can have some success against San Francisco because they have been very good against the run, which is the core of the San Francisco offense, but I think Carson Palmer will give the ball away a couple times and they will get torn up through the air by Colin Kaepernick and that will be the difference. A Drew Brees-Tom Brady matchup is one that the TV networks and the fans greatly enjoy and while both clubs saw their offenses muted somewhat in their games this past week, we should see plenty of passing action. While the Saints have been explosive all season long as expected, one could not say the same for the Patriots who have scored an average of 19 points-per-game. However, I think they will wake up this week, even against a much-improved New Orleans defense. The NFC East is so bad that a game with teams whose combined records are 3-6 is just about a game for first place, as this one is. The Cowboys lit up the scoreboard last week, putting up over 500 passing yards and 48 points, but considering they were playing the Broncos, they lost. But considering that they now get go up against the miserable Washington defense, they should see their offensive output be put to better use. The Colts have been looking excellent ever since the Trent Richardson deal with Cleveland but it's not as if they have been running the ball well, or that Richardson has played well. The success is due to a much improved defense and Andrew Luck, who has looked great and nothing less. With how well they have been playing, and how inconsistent the Chargers look, I do not have much reason to see their run not continuing. So what you are saying is that the Jaguars need to sign Tim Tebow if they want a chance at winning. Isn't that the closest they can get to having "the good Lord on their side?" Haha well done. 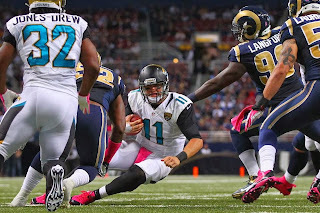 Not even Tim Tebow could salvage the Jaguars, but at least he would make them a little more interesting. Redskins are going to shock everybody this week, don't count them out yet! After League of Denial, what is next for the NFL?